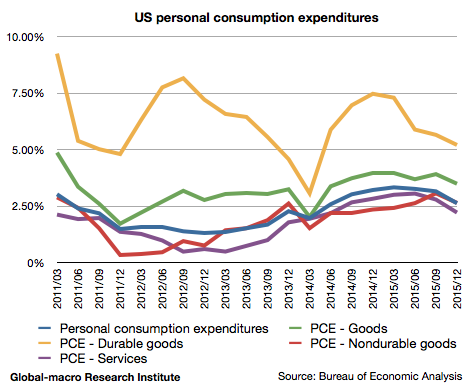 The personal consumption grew 2.62%, slowing down from 3.15% in the previous quarter. It was for the first time in more than one year that the growth went below 3%. All of the durable goods, non-durable goods and services slowed down. The interpretation of these figures is essential for investors, as the performance of their portfolio will depend on how they comprehend why the consumption decelerated even though the cheap petrol should have helped the American households, which transport heavily depends on cars. It is certain that the cheap petrol produced some cash in the consumers’ wallets. Then where did the money go? One possibility is that they increased their savings. Another is that with the money they paid their debt. We personally bet on the latter. 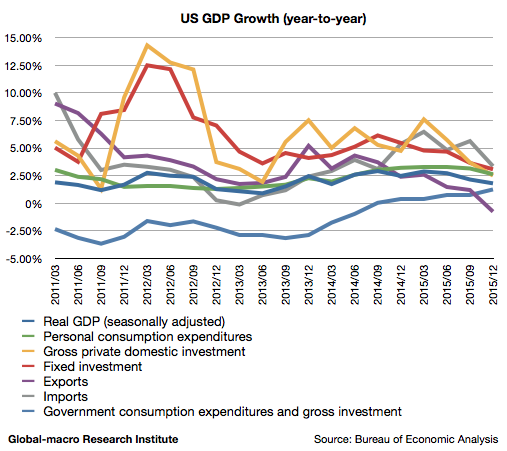 Dr Larry Summers’s theory of secular stagnation, or the contraction phase of the long-term debt cycle. If our supposition is right, the further rate hikes in 2016 will cause a serious effect on the consumers’ psychology, especially ones with a huge debt. The interpretation of the consumption determines the future of the rate hikes, and thus it determines the future of your investment portfolio. Let us remember what Mr George Soros said in Davos. “Deflationary expectations had already set in and consumers were less likely to respond to lower borrowing costs with increased spending.” (Bloomberg) He must be seeing the same thing. 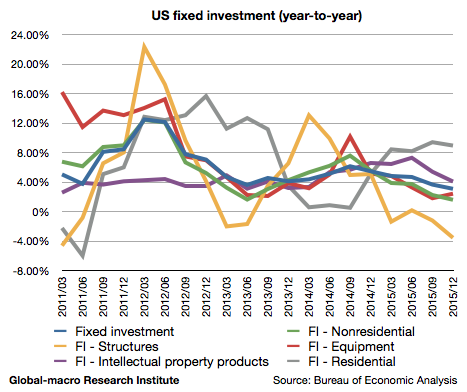 The fixed investment slowed down from 3.65% in the previous quarter to 3.08% in this quarter. Investment in structures, intellectual properties and residences decelerated, while, to our surprise, that in equipment accelerated from 1.80% in the previous quarter to 2.41%. The slowdown in investment is largely due to the decline in investment by energy companies, and then it is not very clear how we could interpret the rise in equipment. We would not make an easy guess on the one-time rise during the downtrend, but we will keep it in mind. The last elements to analyze are trades. Amid the concerns about the strong dollar affecting the exporters, the growth of the exports grew -0.76%, negatively, compared to positive 1.20% in the previous quarter. Despite the strong currency, the imports also slowed down from 5.62% to 3.35%. 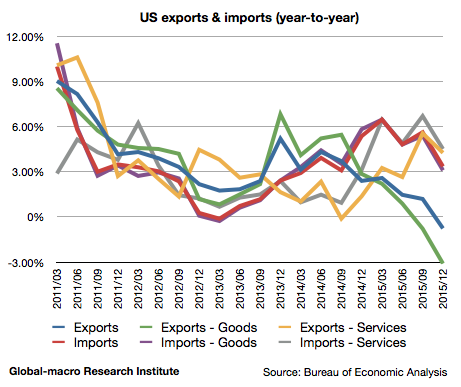 It is obvious in the chart that the exports are not in a good condition. It is led by the exports of goods, although the exports of services, which had been accelerating, also slowed down. The bad figure of the imports would suggest the weak national demand, which would be critical for the global economy, which has been led by the US economy, whilst the economies of China, Europe and Japan are not strongly growing. Now we are thoroughly convinced that the Fed will eventually admit that it cannot raise rates and resume easing, which will justify our investment in gold. The world economy must face the fact that even the massive QE could not lift the economy sufficiently. The options that are left for us are quite limited.